When your foot is stuck up in the air, you need something to look forward to. 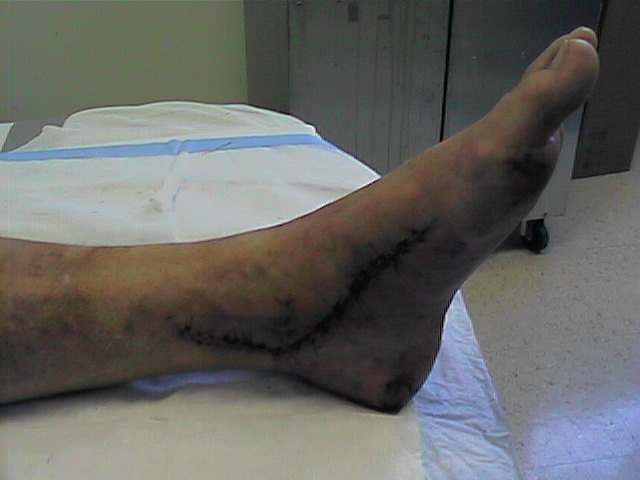 I was looking forward to the removal of the splint, and my first look at The Foot. I expected it to look like the work of Dr. Frankenstein, and wasn't disappointed. I was tended to by a gentle and competent nurse named Donna. She removed the splint, cleaned up things, removed the stitches (38), and applied the cast. Lorette helped. 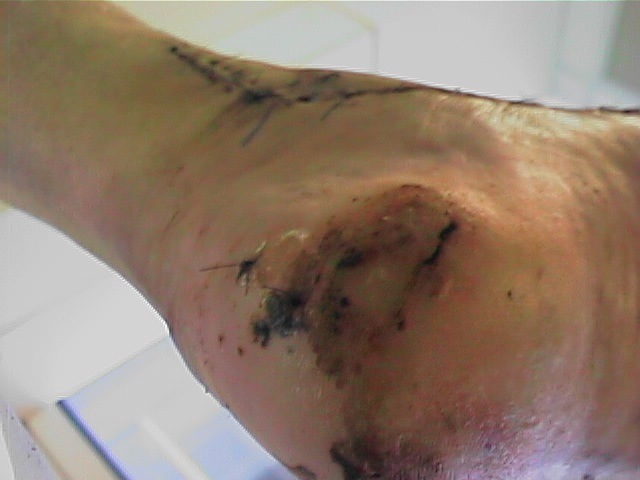 Where the offending tendon is. 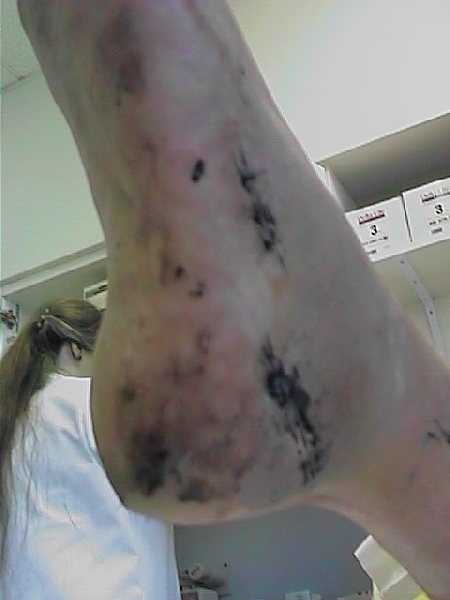 The outside of the same foot. You can see where they borrowed some bone for the calcaneal osteotomy. 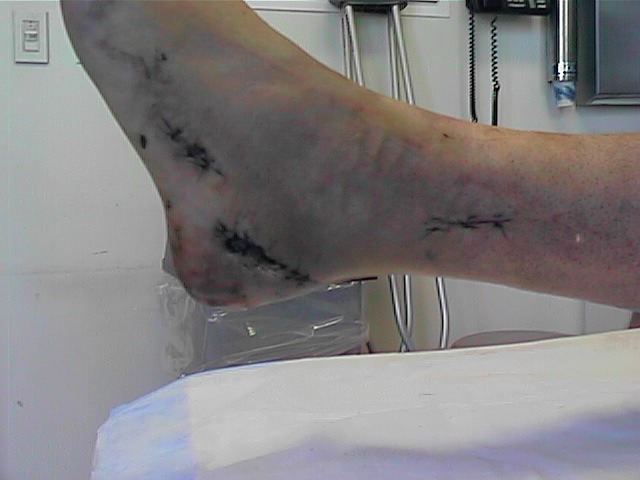 A view of the heel where they cut the bone. The inside of the heel where they had to poke a hole to screw in the screws. I guess it's harder than getting to the back of the carburetor in my old Honda. 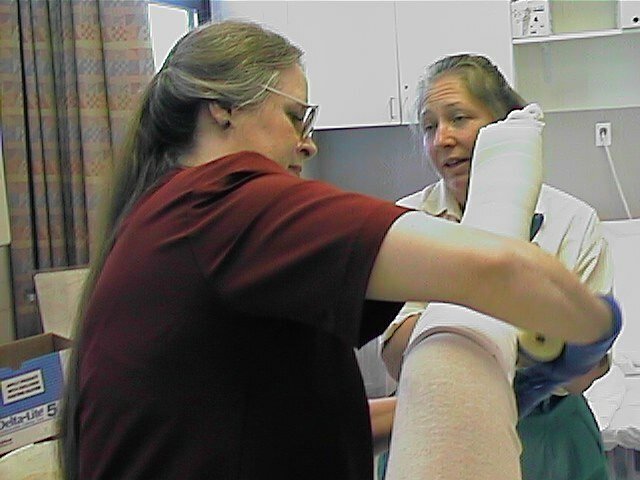 Lorette helps hold up the leg while the cast is created. The cast is made of fiberglass. The strips are moistened with polyurethane, Which glues the whole thing together. If I wanted to, I could sand it and add more coats, bringing out the rich grain of the fiberglass. It turns out that you have a choice of colors. My helpers chose green (of course) plus an oxymoron called "neon camo". For the technically inclined, the surgery report is available. 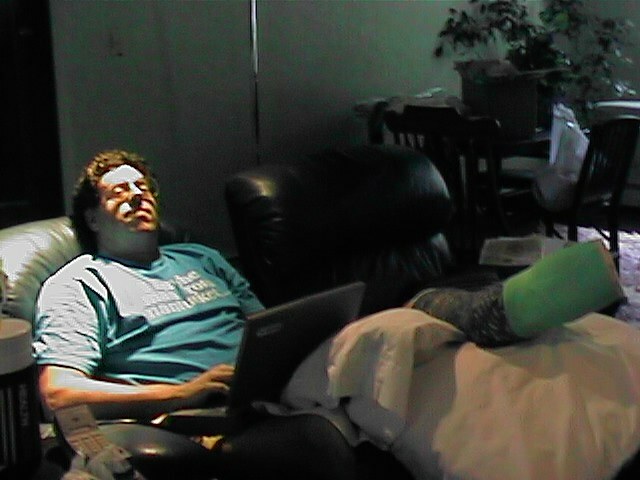 Spirits (and my toes) are still high, and I am able to type on the laptop for a while, though eventually my back complains about this poor posture. The cast stays on for four weeks. Then we go in for an Official Check and x-rays. Then another cast (don't get that one wet either!) for another four weeks. The next cast will bring the beginning of weight bearing.